Questioning Leadership offers a diverse mix of cutting-edge research in the field of educational leadership, with contributions from expert and emerging leadership scholars. It contextualises school leadership within broader social and historical contexts and traces its influence on school performance through time, from its relatively modest role within a systems theory paradigm to its growing influence from the 1980s onwards, as exercising leadership came to be perceived as being largely responsible for improving educational outcomes. Is leadership really necessary for high-quality school performance? Can schools function effectively without leadership? Is it possible to describe the work that principals do without using the word ‘leadership’? How do we challenge the assumption that leadership simply exists and that it is seen as the appropriate default explanation for school performance? This book does not assume that leadership is the key to organisational performance, although it acknowledges the work that principals do. It goes against current orthodoxy and offers varied perspectives on how leadership might be repositioned vis-à-vis organisational and institutional structures. It also suggests some new directions for leading and learning and throws open a discussion on leadership that for too long has been captured by the assumption that the leader is the cause of organisational performance and learning outcomes in schools. At a time when leadership’s dominance seems unshakeable, this is a bold book that should appeal to postgraduate students of educational leadership and management, those undertaking training in educational administration and current school leaders interested in exploring the value of leadership for educational organisations. Gabriele Lakomski is Professor Emeritus at the Melbourne Graduate School of Education at the University of Melbourne, Australia. Scott Eacott is Senior Lecturer at the School of Education at the University of New South Wales, Australia, and Adjunct Professor of Educational Leadership at the University of Saskatchewan, Canada. Colin W. Evers is Professor of Educational Leadership at the University of New South Wales, Australia. Questioning Leadership—it’s about time! Leadership is one of the most overused terms in contemporary society. Unfortunately, the concept of leadership has become ambiguous, misleading, a ‘catch cry,’ and in the end, a meaningless cliché, which makes its systematic analysis, discourse, and study perilous at best. This book is a welcome attempt to balance the glorified rhetoric of leadership with the structural and contextual constraints that make leadership difficult, situational, and paradoxical. Questioning Leadership is a timely challenge to the current canons of leader-centrism; it restores equilibrium and reflectiveness to a diverse term that has become a hackneyed slogan. This corrective collection is required reading for all who love to learn and dare to lead. Just as the reforming school principal has become a key part of the mythology of devolved systems of schooling, so have relatively unexamined notions of school leadership come to dominate academic accounts of contemporary school management. This important book helps us to move beyond such lazy thinking. Following on from her earlier work, Managing without Leadership, Lakomski and her colleagues subject over-individualized understandings of leadership to sustained theoretical scrutiny. Although the editors insist they are asking questions rather than providing answers, their impressive array of contributors and commentators offers us a rich choice of alternative ways of understanding school leadership. 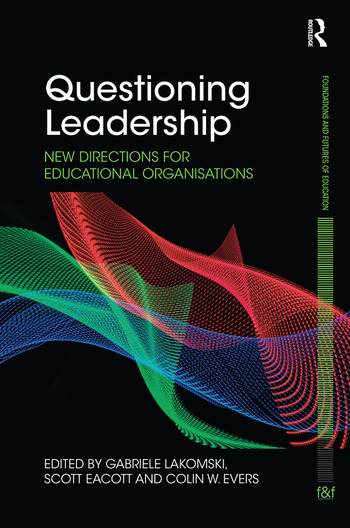 Questioning Leadership edited by Gabriele Lakomski, Scott Eacott and Colin Evers arrives on the scene at a critical time. Educational leadership is in need of critical examination right now, before we jump off a cliff after the next big thing, the next leadership fad or fetish. Well-conceived and adroitly executed, the book speaks to an important issue of our time: leadership, generally, and educational leadership more specifically. Lest the book be pigeon-holed and, therefore, dismissed, be it known that this book speaks to leadership writ large; any and all can come away from reading it more considerate, more enlightened, more thoughtful. The format of the book is unique and uniquely suited to its intended aim—to look at leadership from top to bottom, head to tail, and inside out, and from multiple vantage points. Lakomski, Eacott, and Evers have assembled some of the best scholars in the field today, and they provide the reader with some of their best ideas. The tone of the book is such that all can engage with its content, concepts and concerns, and we, our schools and our students will be all the better for it. Duncan Waite, Professor, Community and Educational Leadership, Texas State University, USA and Director of The International Center for Educational Leadership and Social Change.